The beautiful villa located at the Prestigious Los Lagos, Palmas del Mar, is a one level 4 bedroom property with over 5300 sq ft of pure luxury. It has 4 spacious bedrooms, 3 full luxury bathrooms and a powder room, great room family room, dining room, luxurious kitchen with top of the line stainless steel appliances, breakfast room, master bathroom with tub, spa style shower, terrace equipped with top of the line Viking BBQ, sink and refrigerator, plus pool. The garage area has also been converted into a game room with pool table and air hockey table. 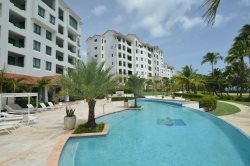 Full access to Los Lagos Spa (gym, pool, and playground for children) located 1/2 block from the house.